Located at Kennedy Road and Highway 401, The Kennedys is a brand new master-planned community that will soon inject a contemporary vigor to the Scarborough skyline. Developed by Toronto-based Samm Developments, the first phase of the project will consist of 663 suites spread across two 35-storey towers anchored by a shared four-storey podium. 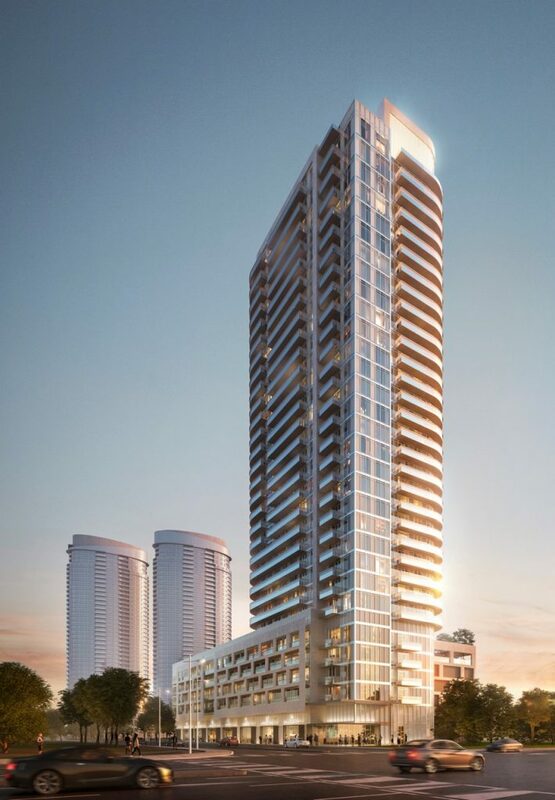 Designed to be the area’s newest landmark, the residential towers feature an elegant architectural design that lives up to the cache of its name. Envisioned by the award-winning Page + Steele/IBI Group Architects, the exteriors of the two differently coloured towers sport a modern and sophisticated flair with curved lines, continuous balconies and expansive spans of glass. 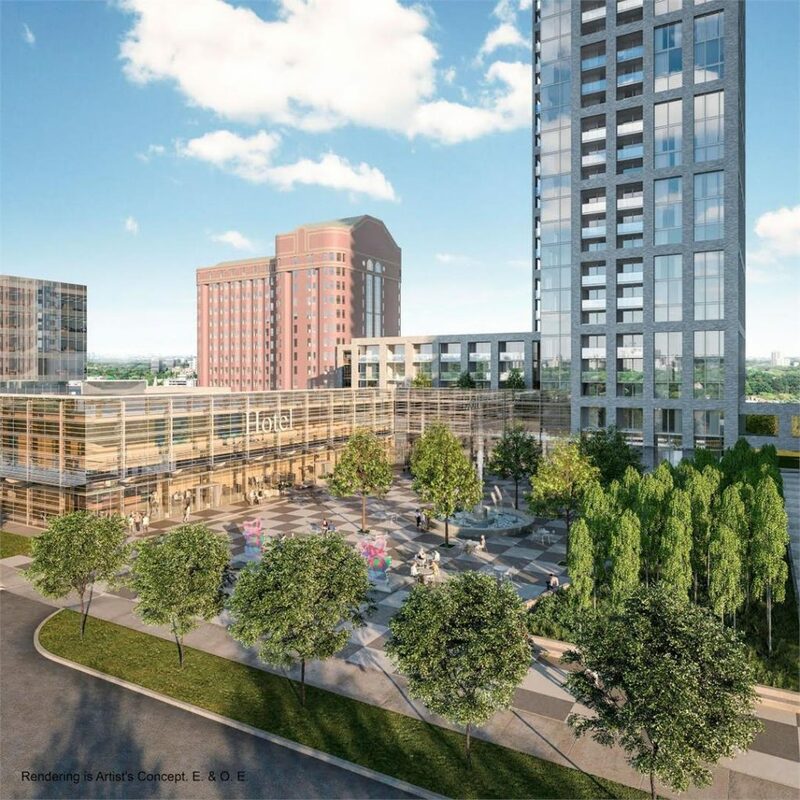 The surrounding area will be replete with greenery and seating areas including a beautiful open-air, landscaped plaza and water feature inspired by the grand courtyards of Europe. At the base of the towers will be four-storey podium designed with random squares cantilevering over the street edge providing a contemporary take on the classic brownstone building. Situated atop the podium is the development’s inviting array of amenities designed by the renowned team at Tomas Pearce Interior Design Consulting Inc. Offering everything from a fully accessible indoor pool with a hot tub to a wellness centre complete with workout and aerobics equipment the amenities at The Kennedys are nothing short of spectacular. For entertaining, a kitchen with chef’s table and dining room is available, while an outdoor lounge provides the perfect spot for alfresco dining and barbecues. Other amenities include a gaming room and lounge for billiards, business centre with WiFi, karaoke room, hotel-style lobby with concierge and several ground level retail spaces. Even more amenities are just minutes away thanks to the project’s desirable location at 2035 Kennedy Road. Whether you’re hitting the links at the Tam O’Shanter Golf Club or exploring the many shops, restaurants and cafes along Sheppard Avenue, the neighbourhood offers a great selection of activities for all. Those who prefer to indulge in a little retail therapy can do so at the Scarborough Town Centre which is easily accessible by TTC and offers over 230 brand name retailers. If you prefer walking to your destination, the nearby Kennedy Commons shopping centre has over 32 brand name stores, including Chapters, Metro, Cafe Mirage and The Brick. Residents will also benefit from numerous parks and green spaces all within walking distance including Collingwood, Dorset, Inglewood Heights, and McDairmid Woods just to name a few. The Midland and Progress campuses of Centennial College and the Ellesmere Community Centre are also within proximity making the community ideal for students and young professionals who wish to further their education. Plus, with easy access to the Agincourt GO Station, Midland TTC station, and Highways 401 and 404, getting to other parts of the city is quick and convenient. Suites at The Kennedys are priced from the low-$200,000s. Don’t miss your chance to be a part of this exquisite master-planned community! 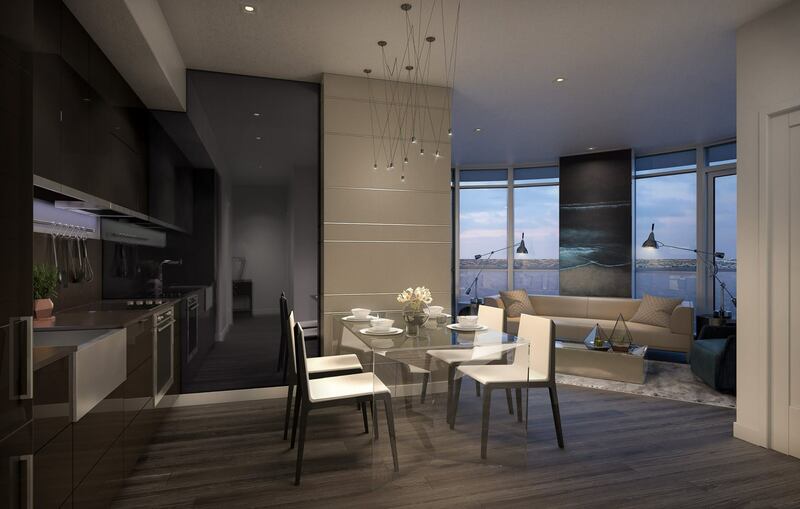 Register today for priority access at KennedyCondos.com. For more information, visit kennedycondos.com.